To say that this election season has been a weird time to be a US expat in México is an understatement. When I first arrived to CDMX two months ago, people occasionally asked me about Trump, what I thought about him, and who I was voting for. As the months progressed, news of the election grew more and more widespread-I began to hear discussions of the presidential debates on the radio in the combi on my way to work, and any development in the campaign made front page news. However, it wasn't until I visited the exhibit on migration in the Museum of Memory and Tolerance that I was hit in the face by the reality of this election in Mexico. The Museum of Memory and Tolerance in México City is a massive museum that focuses on human rights, the Holocaust, and other genocides, with a goal of promoting understanding between different peoples. Their interactive exhibit on migration focuses primarily on the experience of Mexican and Central/South American migrants on the journey to the US. 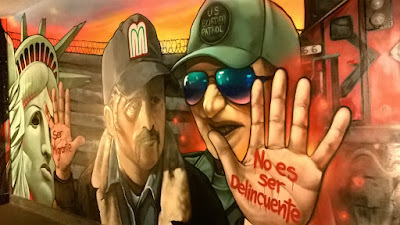 I caught my breath as I entered the first feature of the exhibit, which featured a giant mural depicting the US border patrol, La Migra (Mexican border patrol), and the border wall between the US and México. The other side of the room featured several videos playing at once. One video was a compilation of several white US citizen shouting racial slurs towards undocumented migrants. Another was of a white US man who hired a group of undocumented Mexican migrants for a day, claiming he needed them to help him move furniture, only to take them to the local immigration office. This man laughed as he watched the migrants leap from the truck and run across the highway, as if it was some sick joke-which he then uploaded to YouTube. The final video was the now infamous clip from Donald Trump, in which he refers to Mexican immigrants as drug dealers, criminals, and rapists. The mural in the migration exhibit at the Museum of Memory and Tolerance in Mexico City. Fast forward a month and a half, and it is election night. 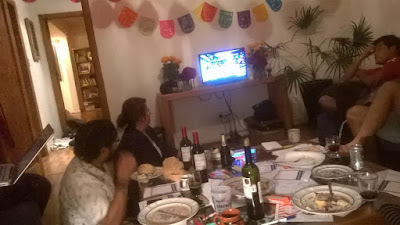 I am in the house of Erika, another US expat, with several of our friends, who hail from México, Canada, France, the United States, and Bolivia. The room hummed with excitement and energy, as we all talked about what it would mean for our respective countries if Hillary were to win. I was impressed by how well informed my non-US friends were about the election, and how concerned they were about the results. I thought about what it would mean to tell my children that I had rang in the election of the first woman president with people from all over the world. However, as the evening passed and more and more results came in, the mood grew somber. We began to talk about what it would mean for our respective countries if Trump won-what it would mean for healthcare, environmental issues, international relations, and the global economy. I jokingly asked my Canadian friend Tyler how much I would have to pay him to marry me for papers. As a North Carolinian who has taken pride in telling my friends here about the people, food, and geography of my home state, I was saddened to see that my state, which is known as one of the most progressive and forward-thinking in the South, take another step in the conservative direction. As midnight came and went, and it became obvious that the final result wasn't going to be known for several more hours, we went to bed with a sinking feeling in the pit of our stomachs. The following morning, I woke up knowing that what I saw when I turned on my phone would have implications for the rest of my life. I felt my stomach drop when the first WhatsApp message came in from my friend Maria in Sevilla, offering her condolences for what had happened. I immediately called my mom and broke down crying-crying for my Muslim, immigrant, LGBTQI+, female, disabled, and POC friends, whose lives would now be irrevocably different. In these first few days after the election results, there have already been instances of surge in hate crimes against Muslims, white supremacist graffiti and swastikas, painted across buildings and churches, black people being told to sit in the back of the bus, and white kindergarteners shouting at their Latino/a classmates to ¨Go back to México!¨. My boyfriend, who is a high-school math teacher, told me that one of his students who is Muslim cried for two hours straight when she first heard the news. Another teacher at his school, who has a transgender daughter, wept for fear of what the future would look like for her child. In this first week after the election, many people have been left to wonder what will happen to their rights, their families, and their futures. The group at the elction watch party. The tough conversations continued when I got home from work. Nef greeted me with a long hug, as any good dad would, and said he was so sorry for what had happened. He and Dani expressed disbelief and shock, saying they had no idea that the US was this misogynistic, and that they expected this kind of stuff to happen in México, not the most powerful country in the world. They said they wanted to see me again after this year, but now aren't sure they ever want to visit the US-or if they would even be able to. They expressed concern for the Mexican economy, wondering if they would lose their jobs, and have to find work in another country, and worrying especially for their loved ones who work paycheck to paycheck. They thought of their loved ones in the US, both those with documents and those without, and what would happen to them and their families. ¨I know someone who is undocumented in the US, but his young children were born there and are US citizens¨, worried Dani. ¨If he and his wife are deported, I don't know what is going to happen to his kids¨. I think a comment from one of Dani´s coworkers sums up the current mood in México best: ¨No sabiamos que los gringos nos odiaran tanto¨. ¨We didn't know that the white people hated us so much¨. Debating the pros and cons of each former candidate is now a moot point. I can only speak to my personal experiences and feelings. And the truth is, I'm terrified. I'm terrified that our president-elect is man with no political or military experience, who has insulted people of color, LGBTQI+ people, people with disabilities, and Muslims, to name just a few. As a proud feminist who worked throughout college in sexual assault prevention education, I am terrified that he has openly bragged about sexually assaulting women. I was excited to have a woman leading the most powerful office in the world, and what that would mean for gender equality everywhere. I also recognize that many people who supported Trump have been some of the most marginalized and forgotten in a changing economy, and are now some of the most vulnerable to his proposed future policies. Clip from Trump's speech at the Museum of Memory and Tolerance. As an expat abroad, I have been the recipient of so much beautiful good and welcome during my time in México. I am called this year to live and learn alongside my host community here in México. However, I am equally called to continue my work for justice and equality at the end of this year, when I return back to the United States. I hope and pray for the space for honest and necessary dialogue during this divided time, and that we work to lift up the very real concerns of the most vulnerable among us, both within our own country, and abroad. For, "The King will reply, 'Truly I tell you, whatever you did for the least of these brothers and sisters of mine you did for me´" (Matthew 25:40). And most of all, I hope and pray that we remember that regardless of our country or nationality, we are all bound by the same ties as children of God-ties that no border or wall can break. Maddie, you are an amazing young woman, and I am filled with hope for our country with young people like you as our future. Thank you for writing this.